So far, I’ve given you some general ideas of what it takes to start and maintain a career in software development but you’re probably still wanting some direction as to the actual first steps of learning how to program. In this chapter, I’ll give you a sampling of the options available. Pay close attention to the links sprinkled throughout for additional information. There are a lot of options out there because there are a lot of different computer languages and types of devices to program. The type of device for which you’re creating an application and the operating system it uses is sometimes called the platform. For example, if you’re programming Windows applications for the PC, then you’d be writing for the Windows platform. The Android OS that powers smartphones and tablets would be a separate platform and would require different programming tools. Some people might get confused by the term platform so it’s easiest just to say “I write Windows programs.” or “I create websites.”. You’ll find that one of the challenges of a programming career is communicating ideas to non-programmers. This entry was posted in Articles, Careers, Programming on April 17, 2014 by Andrew Comeau. You’ve probably heard people talk about how we’re living in the Information Age with an emphasis on how much information there is to process from all different directions. This is certainly true and it can be a challenge for the average person, especially if they were born even a few decades ago before there was a personal computer in almost every home and when most people were happy with a few local channels on their TV. The flip side of living in the information cloud is that it’s never been easier for you to find information and learn virtually any subject. 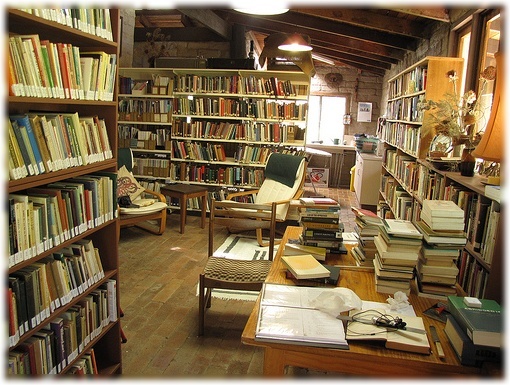 Universities no longer have a monopoly on education and people are no longer dependent on their local library, bookstore or media outlets for materials. Conversely, I never imagined when I was growing up in a small town in the 1970s that, one day, I could be a published author without going through the trials of manuscript submissions, editorial reviews and multiple rejections … but here we are. Ask a lot of people about the requirements to be a computer programmer or software developer and they’ll probably start talking about computer science degrees and years of formal training. Those things don’t hurt but they’re not strictly necessary, either. I personally do not have a degree aside from the accounting diploma I earned from a local college many years ago. I am certified by Microsoft in Windows application development, a certification I earned through self-directed and cooperative study with a few co-workers. Most of what I know about programming is through self-teaching and experience. Nevertheless, with my current experience, all I have to do is post my resume and send copies to a couple of recruiters and my phone starts ringing. It’s about the demonstrated skills, not the paper. This content has been moved to ComeauSoftware.com. This entry was posted in Articles, Internet and tagged Security on April 17, 2014 by Andrew Comeau. For some people, that’s the most challenging question in a job interview. 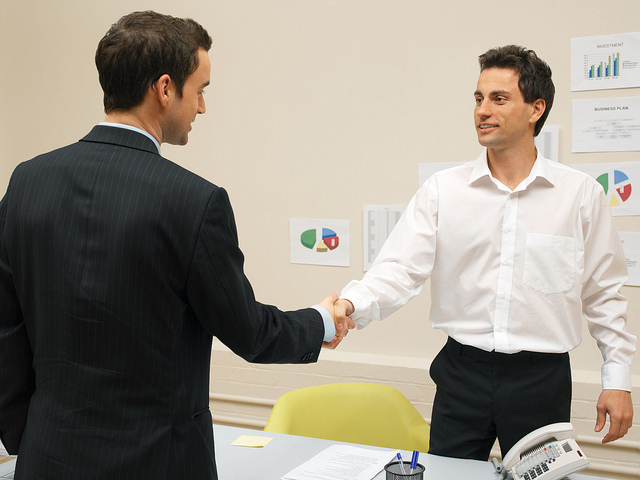 They’ll spend time preparing a resume and anticipating the interviewer’s questions but thinking of questions to ask in return gets the least attention. Some people don’t even see the point in asking questions when they’re just hoping to get the job so they can start paying bills again. Still, the questions that you ask tell the interviewer a lot about you as a potential employee, especially your level of interest in working for the company rather than just collecting a paycheck. When a potential employee has no questions about the company at the end of the interview, he or she can appear lazy or apathetic, which are never desirable traits in an employee. In any professional position, it’s important to find out as much as you can about the company where you might be working for years. That company will have a place on your resume and will impact the future of your career. The right questions will also demonstrate your knowledge and perspective on your chosen field and that you take the time to do research before making a decision. This demonstrates an intelligence and analytical skill that companies like to see in their professional employees. This entry was posted in Articles, Careers and tagged Interviews on January 29, 2014 by Andrew Comeau. Like any system, one of the important traits of a good computer program is the efficiency with which it runs. Many people might think of this in terms of how fast it loads or how dependable it is. It can also be measured by how well organized the interface is which determines how successful the program is in enabling the user to do their job. Programmers like myself also look at how much memory the program uses which can determine whether the program will run reliably or whether the user will be plagued with crashes and blue screens. This entry was posted in Articles, Programming on July 12, 2012 by Andrew Comeau. DataRow objects. In effect, you can have an entire relational database in memory to which your application can refer and save changes, although in practice, I usually limit the data in memory to one datatable or even a single datarow if possible, so as to avoid using too much memory. The above C# example code shows a function that returns a dataset containing a table of quotations like the ones you see at the top of the page. It declares the new dataset and empty table and then uses SQLDataAdapters to retrieve the data from the table into the datatable. The datatable is then added to the dataset which is returned as the output of the function. Once you understand the ADO.NET dataset and other classes involved, this is a quick way to get data for your application from a database or an XML file and it’s something that every programmer should be able to do. However, it’s also a relatively manual process. As you can see in the last example above, referencing the data that’s returned involves referring to rows by number and columns by number or name. You can use a loop to iterate through the rows or you can bind the table to a data grid but when referring to the columns, you still have to remember the ordinal number or the name that comes from the database. 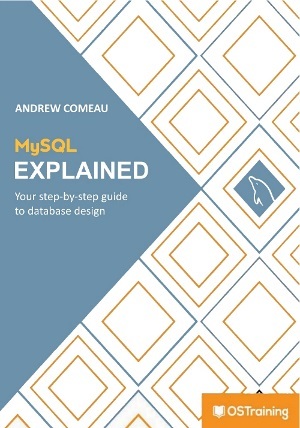 Unless you write nice, organized, classes that group all the database calls in one place, you could also have SQL statements, or preferably stored procedure references, scattered throughout your project. Another type of dataset object in .NET solves some of these problems. The Typed Dataset object is a graphical interface that enables you to simply drag database objects such as tables and stored procedures onto the dataset work area. 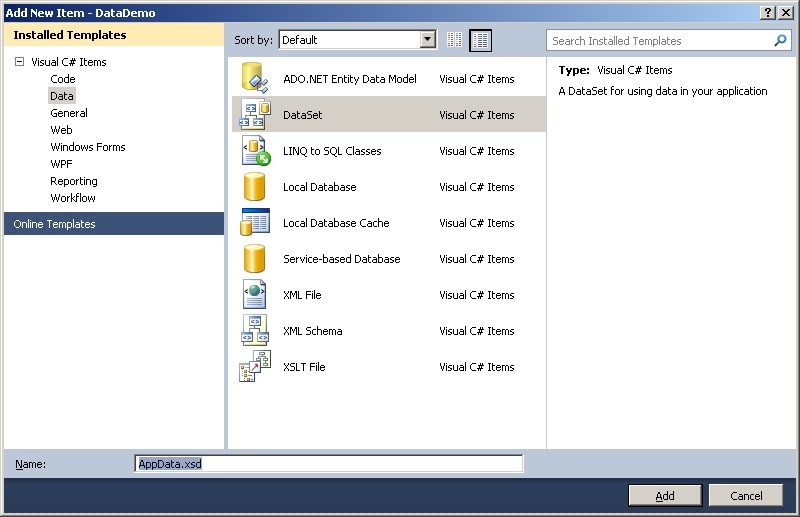 The interface will then discover and document those objects and create custom data classes for them based on the ADO.NET classes mentioned above. For example, if you drag a Customers table onto the work area, it will create a CustomersDataTable class that can hold a collection of CustomerRow objects based on the table’s design. The CustomerRow class will include a property for each of the fields in the Customers table and these properties can be referred to in code instead of the column name or number. A TableAdapter will also be created to go with the CustomersDataTable and this adapter will store the connection information and all the necessary SELECT, UPDATE, INSERT and DELETE queries can be automatically generated by Visual Studio based on the table structure. To use a typed dataset, you have to add one as a new component in the project. You can do this by right-clicking on the project in the Solution Explorer or by selecting Add Component from the Project menu in Visual Studio. Select DataSet from the Data components, enter a name at the bottom and click Add. 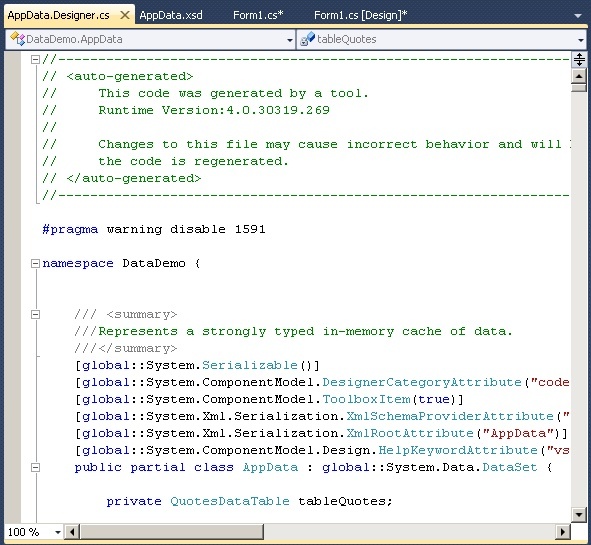 Visual Studio will then add the typed dataset to your project and open it in design mode. As you can see by the help text in the screenshot below, you can actually create dataset objects independently from a backend database using the Dataset toolbox but when starting out, your main purpose will probably be to work with database objects. 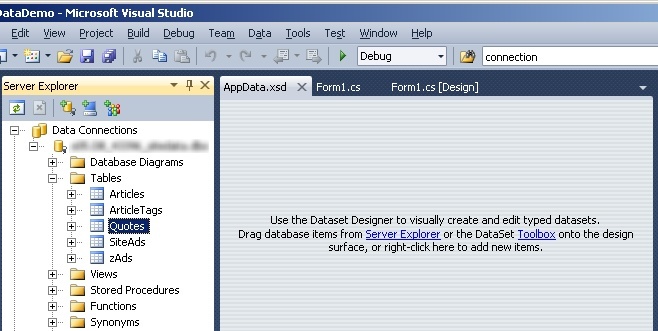 The Server Explorer is the Visual Studio window where you can work with SQL Server databases. If it’s not visible, you can select it from the View menu. Data sources such as tables and stored procedures are dragged onto the dataset workspace in order to include them in the dataset. 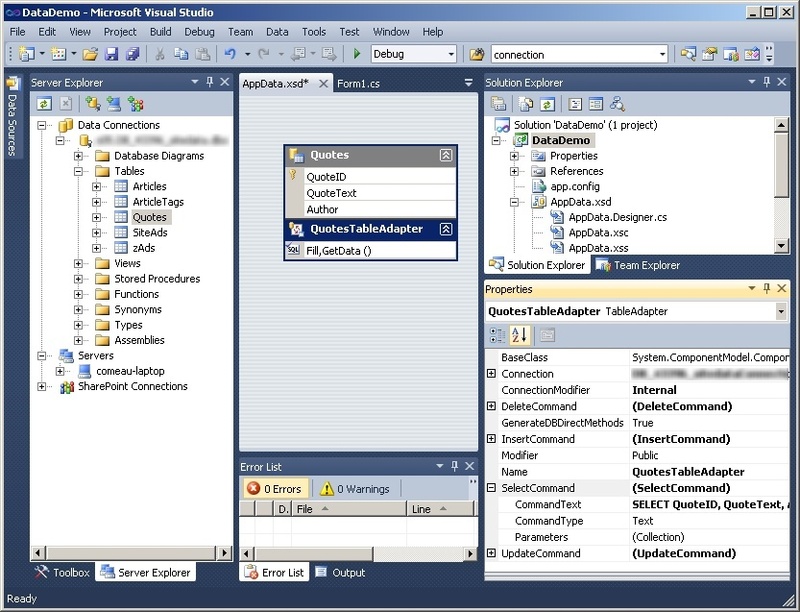 When the table is added to the dataset, Visual Studio creates the necessary classes and objects to represent the table and its fields, along with table adapters to manage the connection with the database. right-hand corner of the screenshot, you can see the properties for the TableAdapter which include the connection details and all queries. The SELECT command is expanded to show part of the SELECT statement that has been automatically generated based on the DataSet’s analysis of the table. In the Solution Explorer, the typed dataset is contained in an XSD file and you’ll notice a few other files underneath it. These are automatically generated as you make changes within the dataset interface. The main file is the Designer.cs file which holds all of the code that defines and supports the objects created in the interface. Automatically generated code for a typed dataset. As it says in the file header, this file is not meant to be manually changed, although you should take a few minutes to look over it to see the sheer volume of code that Visual Studio generates in the background for just one or two objects within the interface. The text of the quote and the author which are stored in fields within the table are now properties of the QuotesRow object and can be called by name in the code. In addition to the advantages in selecting and referencing data, the custom TableAdapter objects have auto-generated methods for updating and deleting rows that can be used as easily as the GetData method was used above. The TableAdapter manages the connections to the database and the typed dataset contains all of the SQL Statements or stored procedure references needed to carry out the operations. This entry was posted in Articles, Programming and tagged C#, Visual Studio on July 10, 2012 by Andrew Comeau.